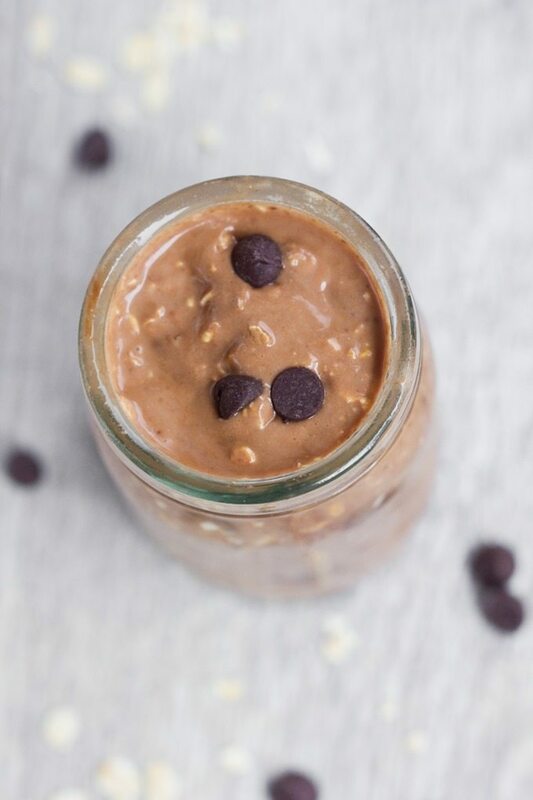 These sinfully healthy brownie batter chocolate overnight oats combine the two best meals of the day, for one unforgettably delicious & filling breakfast treat! 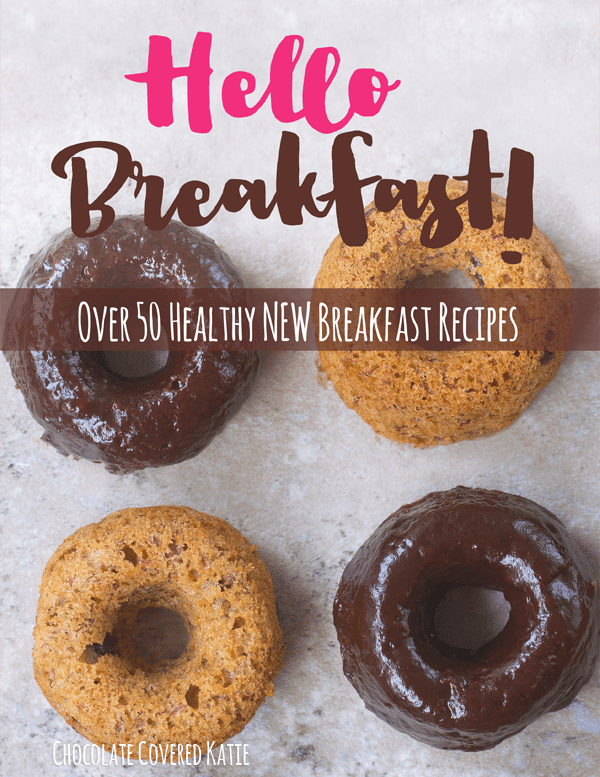 Seeing such high demand for those recipes, I knew I wanted to offer even more options for overnight oatmeal, especially since the original post did not include any chocolate overnight oats recipes! This also gave me an excuse to eat chocolate for breakfast, which is one of my favorite things to do. So no complaints there. 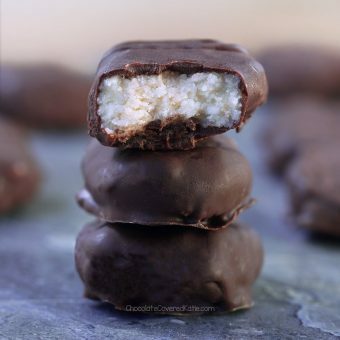 Since I had all the ingredients out anyway, I made some no-bake chocolate oatmeal cookies at the same time… but that is another post for another day! 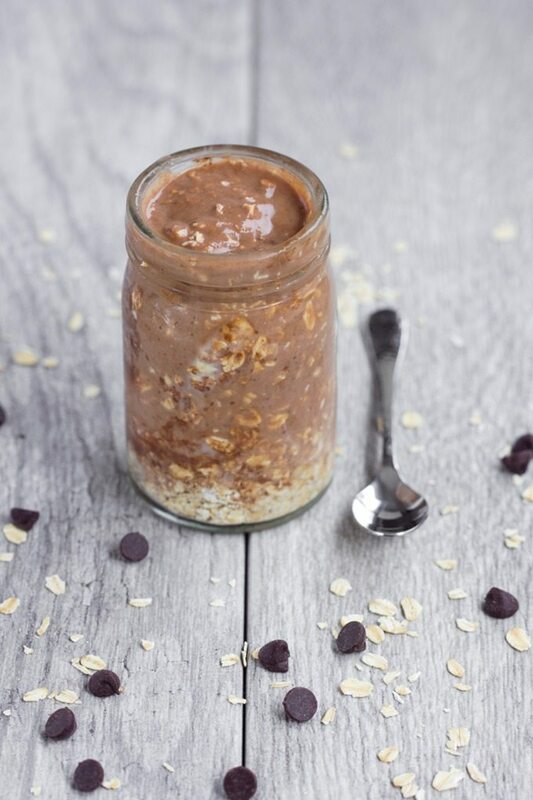 Oh hi, chocolate oatmeal breakfast in a jar. Does anyone else see the chocolate chip face??? 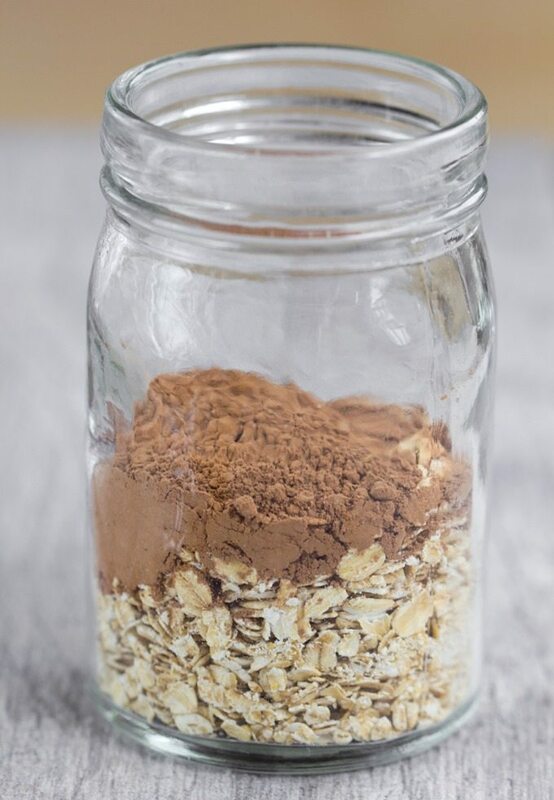 Just like with the original overnight-oats post, these “brownie batter” chocolate overnight oats can be made in just a few simple steps: Layer the ingredients into a mason jar or lidded container, screw the lid on tightly, shake very well, and refrigerate overnight. The next day, unscrew the lid and enjoy. 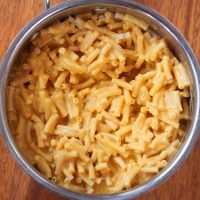 You can also heat before eating, either in the microwave or by transferring to a pot or a bowl. 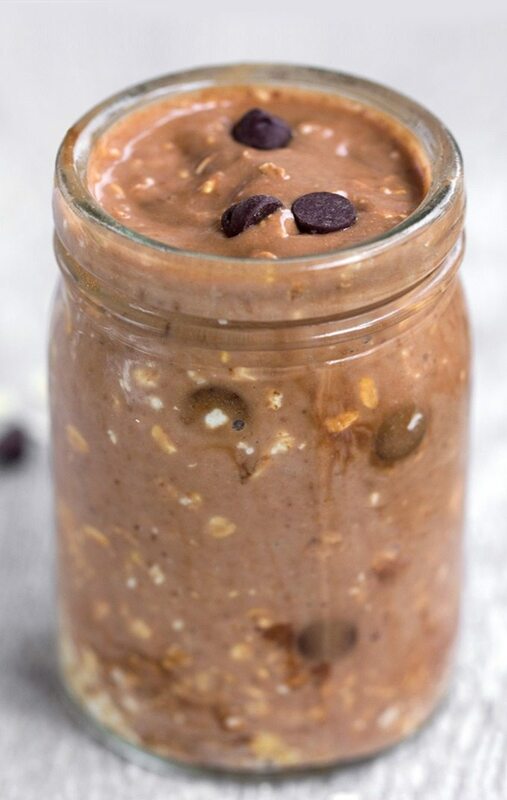 But I like eating these chocolate overnight oats cold, especially as the weather gets warmer. Above, I made a video of the process, to show how easy it is to make the recipe. You can actually make the entire thing in less time than it takes to watch this 25-second video. Talk about fast food! Feel free to customize your chocolate overnight oats by adding chia seeds, peanut butter, sliced banana, or shredded coconut. 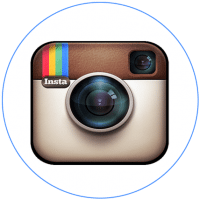 And be sure to tag me on social media if you make them, so I can see and like your photos! Stir together the first three ingredients (and chia, if using) in a mason jar or lidded container. Top with the remaining ingredients, then seal the lid tightly. Shake to evenly combine all ingredients. Transfer to the fridge, and let sit overnight. The next day, simply take off the lid and breakfast is ready! (If you’d prefer, you can also heat it up at this time.) Sweeten as desired, either before or after letting it sit. 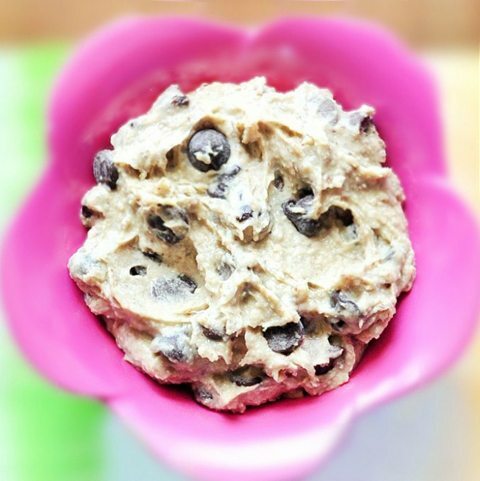 Healthy Cookie Dough Dip – The original version of the internet famous recipe! 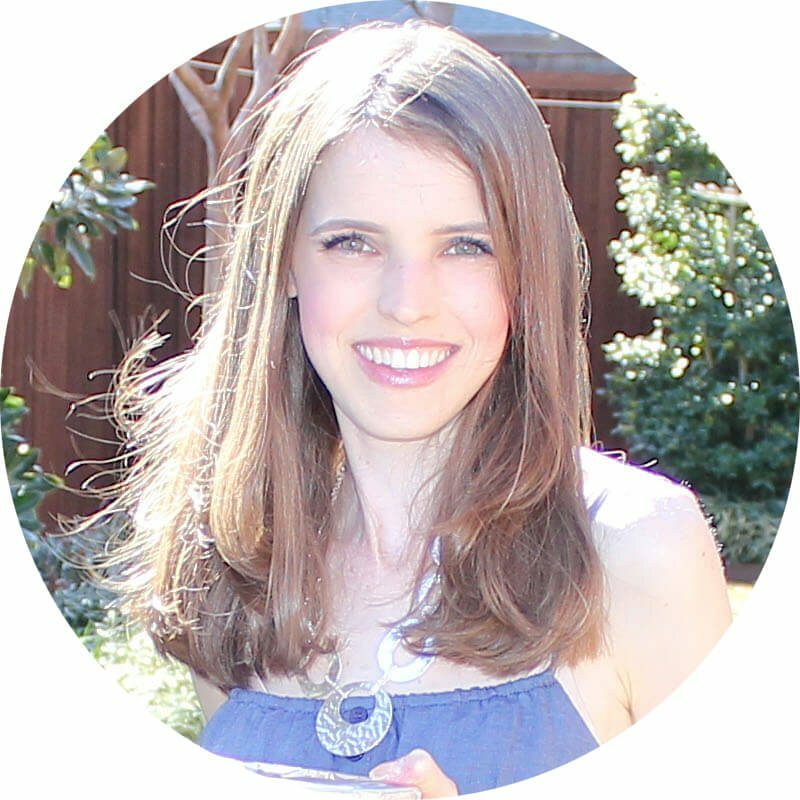 Hi Katie, how would you describe the consistency or texture of overnight oatmeal? I made some one time last year, but I remember the consistency being kind of strange so I never tried it again. It would be nice to have my oatmeal ready to go in the morning so I really want to like overnight oatmeal! (My favorite breakfast is your chocolate peanut butter cup baked oatmeal. I have that almost every morning unless I just need a break from the PB). Hmm hard to describe. Kind of like the texture of yogurt mixed with the texture of a chewy oatmeal cookie. I may have to give it another try 🙂 Thank you! To me it’s a lot like pudding. No no Katie, smh means ‘shaking my head’! This looks amazing, Katie!!! 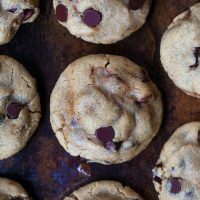 Can you please tell me where you find vegan chocolate chips? Thank you!!! I know “smh” as “shaking my head”. 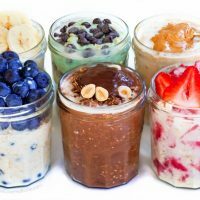 🙂 The chocolate overnight oats looks amazing! Can’t wait to try it! Thanks, Katie! 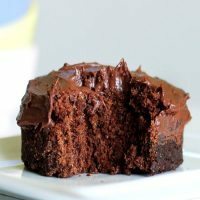 Would substituting flax seed instead of chia seeds work well? Or would it compromise the texture? What if they were ground? It will definitely work! The recipe works with or without the chia. Flaxmeal might give a nice texture change. Oh no, that somehow got left off when I transferred the ingredient list to the recipe-card format… Thank you so much for pointing it out. I just fixed the post. 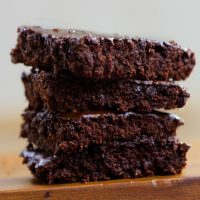 You can add any sweetener you wish – if you’d prefer to keep it sugar-free, you can use stevia or xylitol, or you can even stir in melted banana or date paste. Maple syrup is also really good. Amount will depend on your tastebuds and also if your yogurt is sweetened or unsweetened. I definitely want to give this a try; it looks amazing! 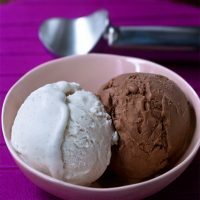 But is it OK to add greek yogurt in place of the plain yogurt? Also can honey be used as a sweetener? Thanks! Oh no no no, nut butter is NOT an optional ingredient. 😉 I am actually the total opposite where I LOVE my oatmeal hot, expanded in a bowl and soft! However, chocolate for breakfast? TOTALLY on the same page. I can pretty much have these oats any time of the day and be happy! I always thought “smh” meant “shaking my head.” I guess it can mean either one! Lol, you learn something new every day. My brothers think I’m crazy when I eat chocolate waffles or even just have chocolate chips in my pancakes. I tell them they’re the crazy ones! I can imagine their faces when they see me dipping into a big jar of brownie batter oatmeal! On my backpacking trips we call something similar to this recipe “Hang Dog.” At home we combine instant oatmeal, powdered milk, cocoa, brown sugar, dash of salt, and chocolate chips. In camp in the evening, we pour water in the zip bag and squish it around. After eating it in the morning we’re so zinged with energy we can pour on the miles for a long time without needing a food break. Thanks for the reminder! Hang Dog season will soon be here. I had it this morning for breakfast topped with blueberries. I think it’s my favorite overnight oatmeal recipe now! This looks great, and healthy! I do have a question about the calorie count though. 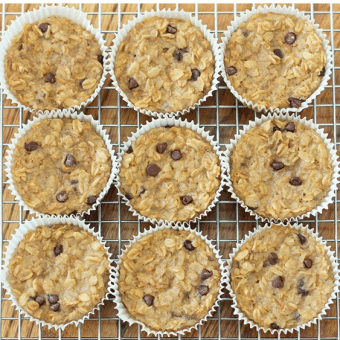 1/2 a cup of oats has 150 calories, and 1 tablespoon of oil or nut butter has 100. That is 250 calories before adding the milk, yogurt, chia, and sweetener and cocoa and chocolate chips. My calorie count is about 350 for this as one serving–still reasonable and healthy, but a difference for those of us counting calories. 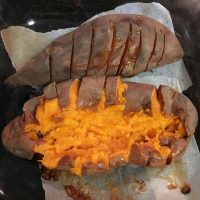 Thanks for another great recipe that I will try!! I keep trying to figure this out too. I need to find these super low calorie oats. Mine just came out to 460 calories. I think maybe you are including optional ingredients? The nut butter is optional. And cashewmilk only has 25 calories for a cup! I also questioned the calories. When I totalled up the recipe it added up to FAR more than what was stated. I also used 0% fat Greek yogurt. Still super tasty though! I was thinking the same thing. Fat is off too. 1 tbsp of nut butter is 7g. That’s before anything else. 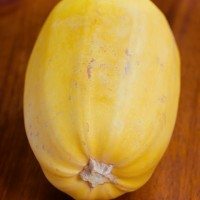 Fat is listed as 6.8 for recipe. Did you make it from her emails? She mentioned above that the sweetener was left off in the email. That could have been what happened to yours! I’m giving it 5 smiley faces! I just had this for breakfast after making it last night. It was so good! 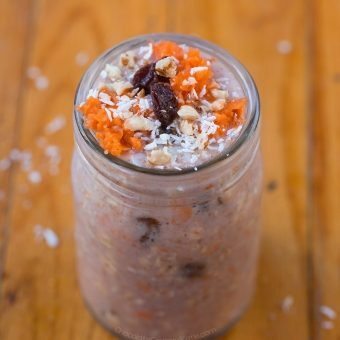 I have overnight oats almost daily, but I’ve never made them with yogurt before (I just use almond milk). 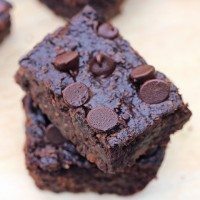 I made this recipe with half a container of SoDelicious Greek Style Coconut Milk Strawberry (that’s just what I already had), a tsp of chia seeds, and 1/2 a tbsp chocolate chips. It tasted like I was eating chocolate covered strawberries! And I loved the creaminess that the yogurt added to the oats. 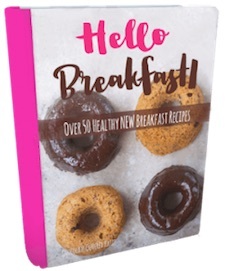 This is definitely going to be a new breakfast staple for me. Thanks Katie! 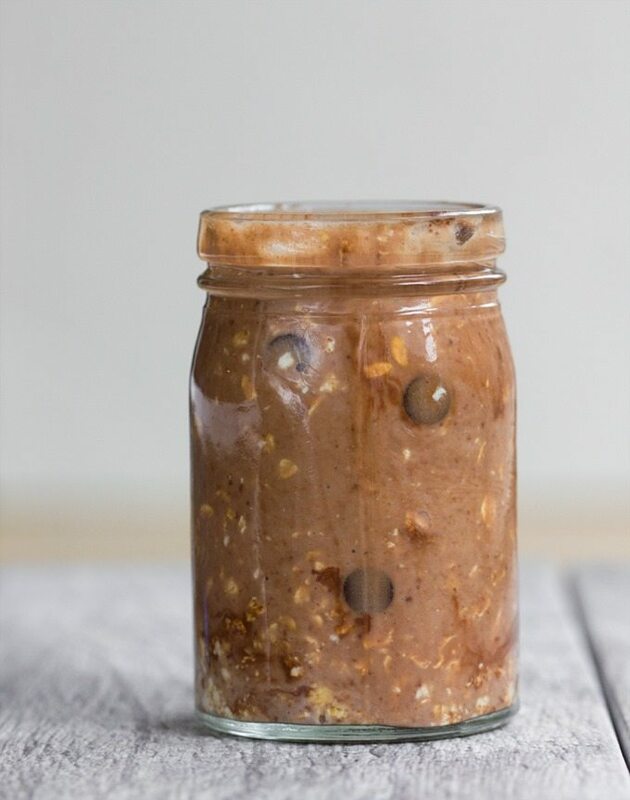 My kids and I love chocolate overnight oats! I combine the cocoa powder with maple syrup or honey first and mix it well. Then I add the almond milk and stir it into chocolate milk before adding the other ingredients. 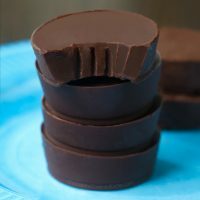 Doing it that way seems to help the distribution of the chocolateyness lol. We top it in the morning with chopped walnuts, almonds and strawberries. Soooo yum! The kids have theirs in mugs with handles.